A welcoming place where children come to experience unique and special relationships with their teachers. A place where children engage in developmentally appropriate activities that prepare them for more advanced learning. A place where parents can learn how to improve their parenting skills or to handle difficult family situations. A place where children learn about healthy lifestyles and eat warm, nourishing meals and snacks. Winter Park Day Nursery will build a stronger community by providing high-quality, affordable early childhood education that will prepare our children to succeed in school and life. 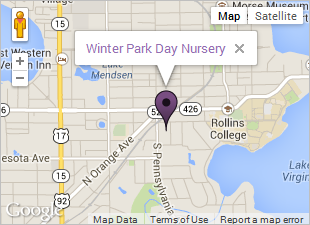 Winter Park Day Nursery uses the nationally recognized High/Scope curriculum, based on the concept that children learn best by pursuing their personal interests and goals. Children in High/Scope settings are encouraged to make choices about activities throughout the day. As they pursue their choices and plans, children explore, ask and answer questions, solve problems and interact with their classmates and adults. In this environment, children naturally engage in key activities that foster developmentally important skills.